The annual Ronning Lab Winter Solstifest was held a day early. We were happily joined by friends and colleagues Ajith, Emanuela, and Mike as well as Megan and Meddie. Great food and fun was had by all. Cecile decided to visit us, so we had an impromptu lab party. A good excuse for Indian food. The Ronning lab welcomes Rasangi Pathirage and Brooke Ballis. Rasangi will initially be working on enzymes related to mycobacterial primary metabolism and Brooke will be studying some methyltransferases important for mycobacterial viability. A 5-year review of structural biology performed at the Oak Ridge National Lab IMAGINE beam line was published in ACTA Cryst D this month. A portion of one neutron crystal structure published by Mike Banco from the Ronning group in PNAS 2016 was used for the cover illustration. If you have access to ACTA Cryst D, the following link will take you to the review. 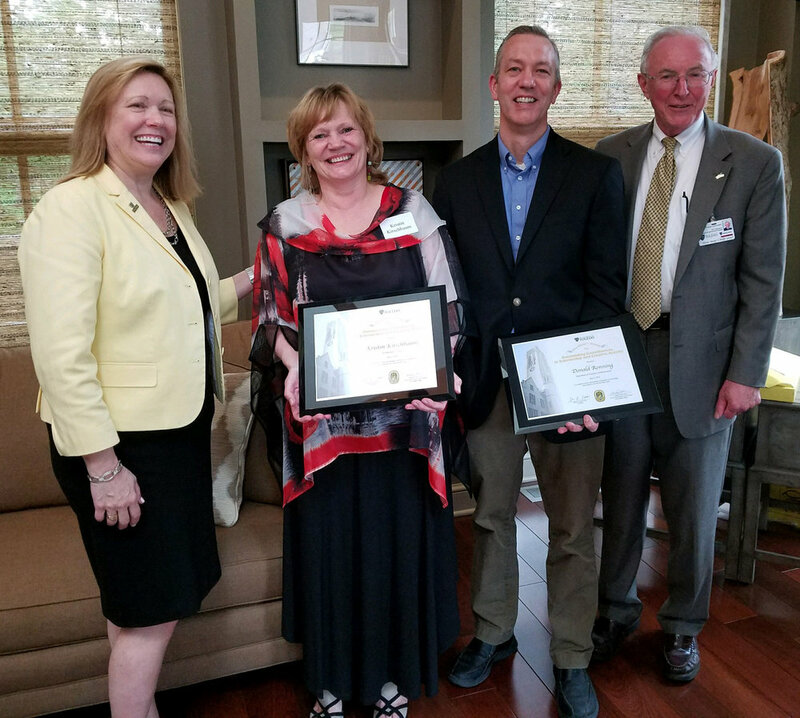 Dr. Ronning, along with 25 other University of Toledo faculty, was honored for his "Outstanding Contributions in Scholarship" by University of Toledo President, Sharon Gaber, during a ceremony at the President's home. Pictured below from left to right are President Gaber, Kristin Kirshbaum (who also won an award and is the Director of the College of Natural Sciences and Mathematic Instrumentation Center), Don Ronning, and Frank Calzonetti (Vice President for Research).